It's wedding season! That means wedding nails! 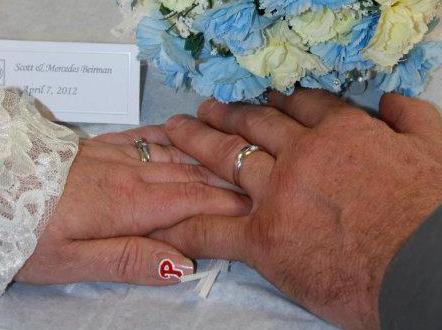 Last year boyfriends mother got married and I painted a neutral and white lace design on her nails with a Phillies P on the thumb. (They're big baseball fans) Unfortunately I couldn't find a picture of the whole mani, but here is the Phillies logo. 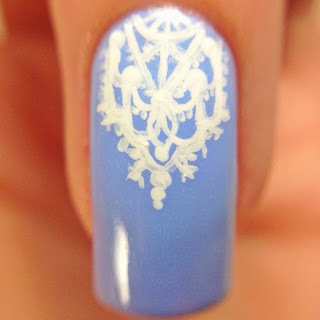 To match my dress I created navy blue nails with white lace accents. Keep in mind this is when I first started nail art and I was not very experienced. Bleh, talk about needing clean up! I decided to revisit this theme now that it is wedding season again! This is also a fun way to see how far I've come in nail art. I wanted to keep the blue and lace theme but make it more pastel and light, like something I could see a bride wearing. Here is a close up. You can see each individual little brush stroke. What do you think about these wedding nails? Would you wear them to your wedding? Did you have a special mani for your big day? Let me know in the comments. Beyond stunning! Beats me how you can paint like that! What brush/tool did you use for this? I love the phillies nails for her wedding! How cute! !